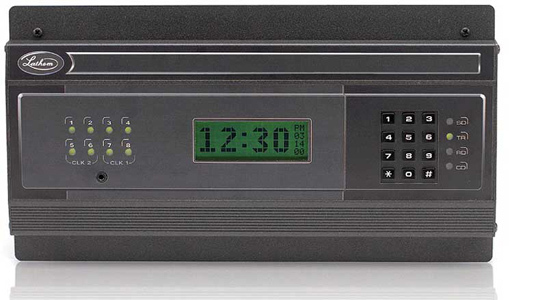 Control up to 17 digital, or 20-28 analog clocks. Power boosters are available. Eight 64 event schedules can be activativated individually, or in groups, allowing for up to 512 active events. Each event (ring) can be set to a different duration (like 1 second for a 2 minute warning "lunch ending", then 3 seconds for class change or "get back to work." Special schedules for holidays and automiatic schedule changes programmed in advance of their activation dates*. * Requries MasterLink software; a demo CD is included. Automatic Daylight Savings Time adjustments, supporting international requirements. Keypad and text/menu display allows convenient programming changes to schedules. Dual password level grant appropriate control to installer/administrators and general users. Multi-function events each include the day(s) of the week, the effected circuit(s), the time and duration of the event. Special schedules for holidays and automatic schedule changes programmed in advance of their activation dates. Available with surface, semi-flush, and 19" rack mount hardware, and capable of drop-ceiling/raised floor installation with optional cable. Schedules and timekeeping functions are retained during power failures; proprietary algorithms allow for rapid, automatic clock recovery. Demo verison of MasterLink software is included with LTR8-512 only. > Semi-flush: 7"H x 13"W x 1.12"
Accuracy: +- 30 seconds per year. Manually synchronized.